The president of the largest federation of unions in the United States is not ruling out the possibility that ALF-CIO, which represents over 12 million active and retired workers across the country, could endorse President Donald Trump for re-election in 2020. Speaking at a breakfast roundtable sponsored by The Christian Science Monitor on Wednesday, Richard Trumka was asked by Newsmax‘s John Gizzi if it was "outside the question" the AFL-CIO might endorse Trump for re-election given the popularity the president enjoys amongst a cross-section of the union's membership. "You have many members who like President Trump and voted for him in 2016, is that still the case?" Gizzi asked. "Is there a large cadre of Trump loyalists, who are also card-carrying members of the AFL-CIO and is it outside the question, outside reality that you might endorse him for re-election next time?" Trumka, who was re-elected to a third term as the union's president last year, elaborated it was important to understand "the facts" before answering the question. "First of all, let me give you the facts," Trumka said. "Trump got 3 percentage points more of our members than Romney did [in 2012]. Three percentage points. Unfortunately for Hillary [Clinton], she got 10 percentage points less of our members than Obama did [in 2012.]" CLIP: @AFLCIO President @RichardTrumka on President Trump, trade and possible 2020 endorsement. The union leader elaborated his members were looking for someone to "shake up the status quo" and make the economy work "for working people" when they chose to cast their vote for the president. "You had people that were mad, people who were looking for someone that was going to change the economy," Trumka said. "Our members were looking for someone who was going to shake up the status quo because the status quo wasn't working for them." "Some of them thought they found that candidate in Donald Trump and other like-minded politicians who promised to lift up workers and reign in Wall Street," he added. "That's what they promised." Trumka castigated the "formidable list" of actions the Trump administration has taken to repeal and overturn Obama-era regulations on private enterprise, claiming they adversely impacted his members. 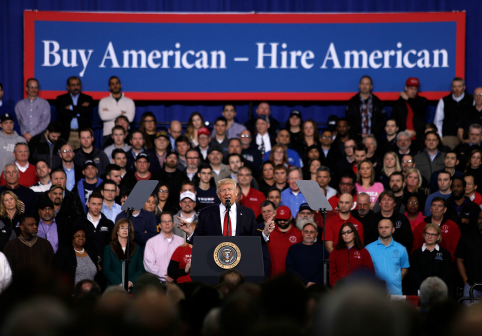 The labor leader also offered praise for the president's trade policies, especially in regards to the North American Free Trade Agreement (NAFTA). "I think he’s going in the right direction on trade," Trumka said. "That was one of the unfulfilled things, if he gets there I think it would be great and we would totally support a re-write of NAFTA if it is a good agreement." "I think that's something he's done right," Trumka reiterated. "Some of the enforcement stuff that he's done [too]." In March, Trumka penned an op-ed in The Washington Post in support of tariffs imposed by the Trump administration on the importation of steel and aluminum from China. At the time, Trumka echoed the president's sentiment that China was engaging in "unfair trade practices" and tariffs were an effective strategy to protect American workers. When asked again by Gizzi if the AFL-CIO would consider endorsing Trump for re-election, Trumka expressed that "every candidate will be looked at" in 2020. "I never said that and I never said we wouldn't consider endorsing him," Trumka said. "What I'm saying is we'll consider every candidate who is running and our members will help us decide which one they think will help us most effectively represent the workers of this country." Trumka's remarks, however, didn't sit well with fellow labor leader Randi Weingarten, the president of the American Federation of Teachers, who took to social media to make her displeasure with Trumka and the AFL-CIO clear. "THIS MUST BE A TYPO.. @RichardTrumka please clarify…. this can’t possibly be what you said," Weingarten tweeted. Trumka did not respond directly to Weingarten's tweet. However, during Wednesday's roundtable, he asserted he would attempt to weigh the president's actions independently. "What I do is real simple," Trumka said. "When he does something that's right for workers, I tell workers and the country, that what he's doing is right. When he does something I think is bad for workers I tell them I think it's bad and we oppose it." While unlikely, if the AFL-CIO was to endorse Trump for re-election, it would mark the first time the union has backed a Republican presidential candidate since 1972. This entry was posted in Politics and tagged 2020 Election, AFL-CIO, NAFTA, President Trump, Richard Trumka, Trump Administration, Unions. Bookmark the permalink.